After 3 years of blogging I decided to take some time off, the last new recipe I actually posted was over 2 months ago. Now that is not a long time in the real world, just long in the blogging world. I don't think people understand the time it takes to actually do what I do. Finding the recipe, making it, modifying it, if needed, making it again, then actually posting it. I got tired of blogging, but mostly I was tired of the same old question I get from people, who don't mean to offend me, is so how is your blog going, does it make any money. This blog to me was never about the money. This is my food journal, this is something that I do for myself, somewhere where I can find my own recipes when I need them. And in a few years, somewhere where my kids can go to when they want to cook something they ate that mama cooked. My daughter already uses the website a lot, she has started to love cooking also, and I love when I see her in the kitchen following one of my recipes. I just love it. I also do this for you. For those of you out there who are looking for new recipes to feed yourself, your family and your friends. I know I love when I come across a website that I trust, so I am hoping I am like that for some of you. So after having some time off, I'm back, and I'm excited to share my new recipes (I have been cooking, I just haven't been sharing). 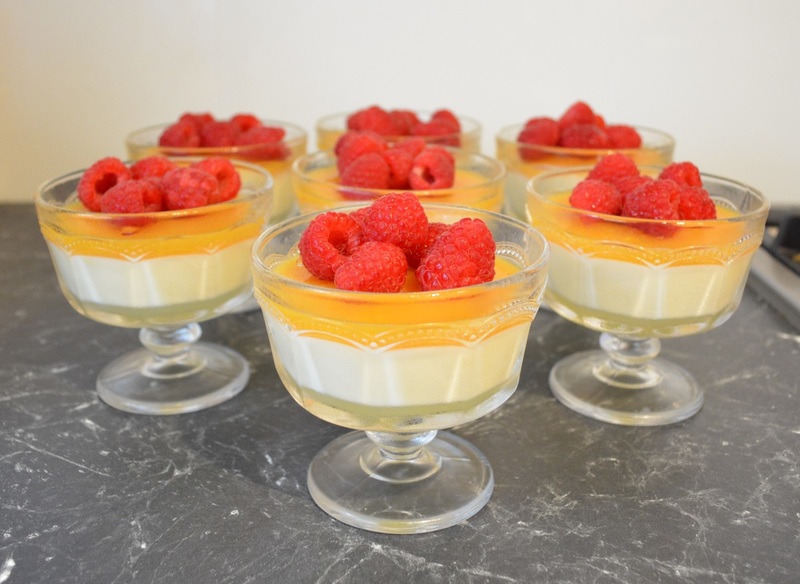 So my first recipe since my break is these Peach Melba Buttermilk Puddings. 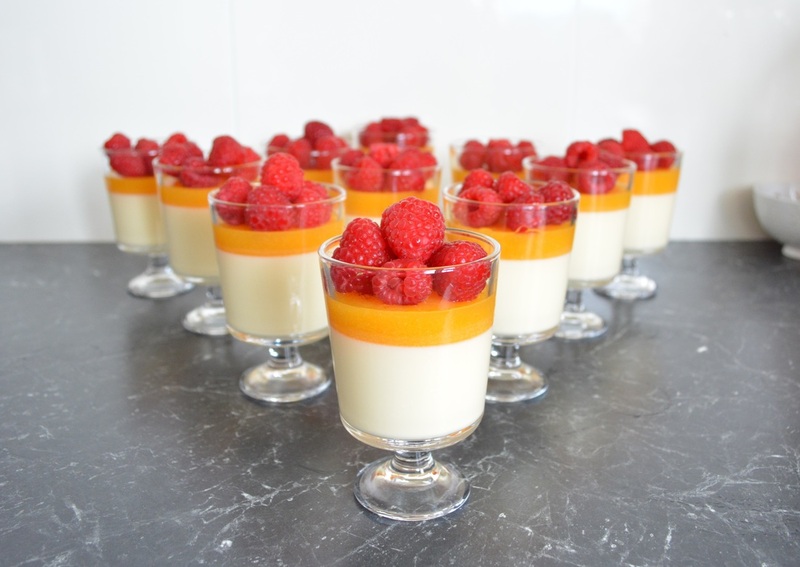 I love peaches, I love pannacotta, I love raspberries, when you put all three together, it is just amazing. This is a great make ahead of time recipe, you can make it two days before needed, just add the raspberries on the day of serving, so they look beautiful on top. Serve it up in any glasses you have, the ones pictured above I bought from IKEA, they are small wine glasses that I find the perfect size for pannacottas, custards, mousses and jellies. The amount of puddings you make from the recipe will be determined by the size of your serving glass. For instance I got 7 servings below and 11 using the glasses pictured above. Now the first time I made these I used fresh peaches, as per recipe, it worked a treat. But I thought to myself why not try it with tinned peaches, they are cheaper, easily accessible and should work also. Well I actually preferred the tinned peaches. The fresh peaches really do need to be ripe, as you will not get much juice from them if they are not, and in all honesty I prefer to eat a fresh peach whole than use it here. But if you have 4 large yellow ripe peaches that you need to use up, use them, it tastes amazing. Also, if using fresh peaches they need to be peeled before blitzing them. Now I will say this is one of the easiest desserts you will ever make, and I mean really easy. Very little can go wrong with this dessert. Actually the only thing I found was that if you look at the photo below, you will see a clear jelly at the base of the panna cotta, this happens if you don't allow the cooked cream to cool enough before refrigerating. Before pouring the cooked cream into your glasses, give the cream a stir, then, after I have placed the puddings in the glasses and in the refrigerator, I use the handle of a teaspoon and give the puddings a gentle stir after they have been in the refrigerator for 30 minutes, this will stop this from happening. But if it does happen, don't stress at all, as it still sets, tastes great and makes no real difference to your dessert, it truly is a minor issue. The panna cotta itself is so creamy and delicious, it really is good, I love the addition of the buttermilk. With the peach part I push all of the peach mixture through a fine sieve, so it is a little pulpy in texture, but we like that, if you want it really smooth, just press down lightly when extracting the juice and discard the solids. Also I add some of the syrup from the tinned peaches about 3-4 tablespoons, as it adds a little sweetness, and makes the peaches thinner. I also have used peaches in syrup and peaches in mango juice, both worked perfectly. So here is a dessert that is truly simple to make, that will impress your family and friends, as it not only looks beautiful, it tastes great to. Soak 3 of the gelatine leaves in cold water for 5 minutes, to soften. Place the cream, sugar, vanilla and buttermilk in a small saucepan over a low-medium heat, stirring, until the sugar has dissolved. Don't allow this mixture to get too hot, it just needs to be warm. Squeeze out the excess water from the gelatine leaves, then add the gelatine to the cream mixture, stirring until the gelatine has dissolved. You can strain the mixture through a fine sieve into a jug, it cools quicker, and makes sure there is no undissolved gelatine, but you don't have to, I generally don't. Allow to cool slightly, for approximately 15 minutes. Once cooled pour the cream mixture evenly into your serving glasses. Refrigerate for 30 minutes, then give it a gentle stir with the handle of a teaspoon, this helps to stop the gelatine separating. Cover and refrigerate for 3-4 hours or until set. Drain the peaches through a sieve into a bowl, you need to reserve 3-4 tablespoons of the liquid. Place the peach flesh into a blender and puree until smooth. Pass the peach puree through a fine sieve into a clean bowl, pressing down to extract the juice. Discard the solids if you want a smooth jelly or push through the solids if you like a pulpy finish. Add the reserved tin liquid, stir, then set aside, until needed. Soak the remaining 2 gelatine leaves in cold water for 5 minutes to soften. Place the peach puree into a small saucepan over a low-medium heat to warm up. Squeeze out the excess water from the gelatine, then add the gelatine to the puree. Remove from heat and stir until the gelatine has dissolved. Allow to cool for 20-30 minutes. Once cooled, carefully pour over the set buttermilk puddings, and refrigerate for a further 2 hours or until set. Garnish the puddings with the raspberries and serve.